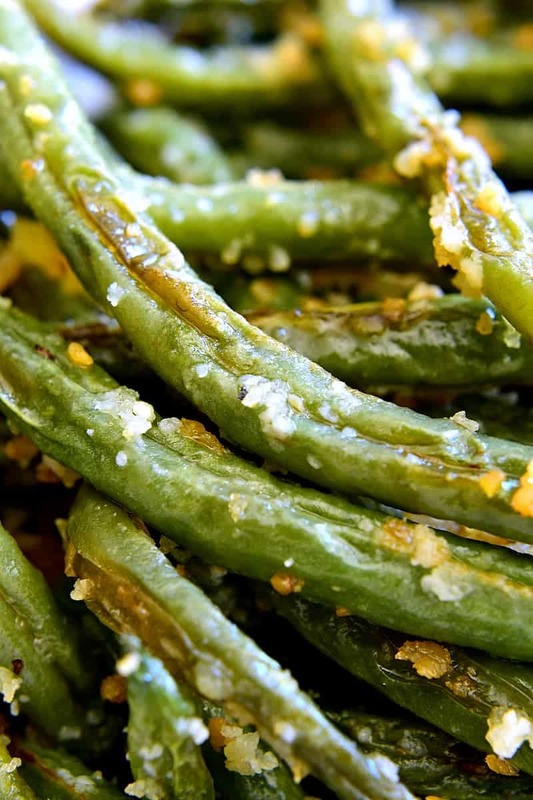 Parmesan Roasted Green Beans are a delicious way to enjoy fresh green beans! Perfect for holidays, dinners, or a healthy snack….and best of all, they’re made with just 5 ingredients! So does it feel like spring where you live, too? We are having a MAJOR warm-up….and we couldn’t be loving it more. We spent the weekend in sandals, with the windows wide open, and I’m pretty sure the girls played outside more than they have in the last 3 months combined. And I have to say. IT WAS AMAZING. It made me realize how much I’ve missed fresh air. And warmth. And sunshine. And how much I love being able to open up the doors and send the kids outside…and have a few moments of peace and quiet! And most of all? It made me super excited for spring. Which actually isn’t too far away. One of my favorite parts of spring is the fact that you can suddenly get GOOD fresh produce again. Seriously – winter is long. And even though the produce is there….it’s just not the same! I’m ready for all the fruits and veggies I’ve been missing. And fresh green beans are high on the list. My family loves green beans raw or cooked or any way in between….but our FAVORITE way to eat them is roasted. There’s something about the combination of olive oil and salt that leads to the perfect flavor and texture, not only for green beans, but for so many vegetables. And when you mix in a little parmesan cheese and some panko bread crumbs to make Parmesan Roasted Green Beans? The result is TO DIE FOR. 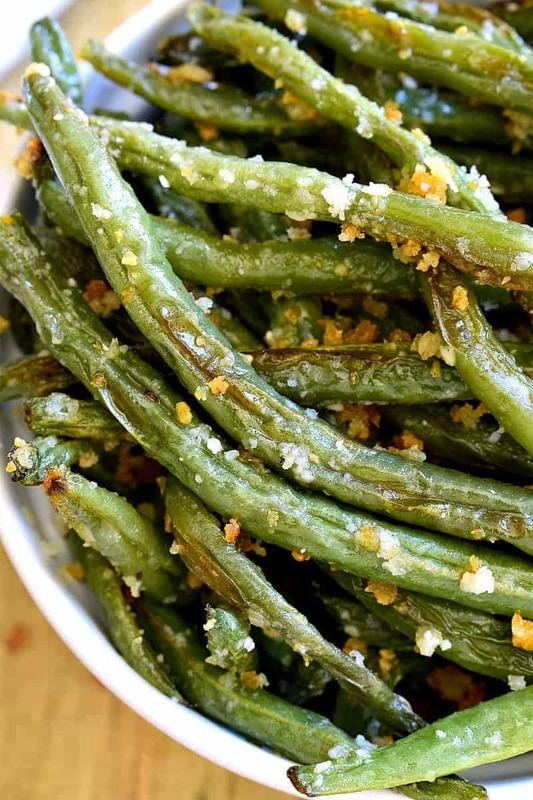 These Parmesan Roasted Green Beans are the BEST. Packed with flavor and crunch and all kinds of deliciousness. 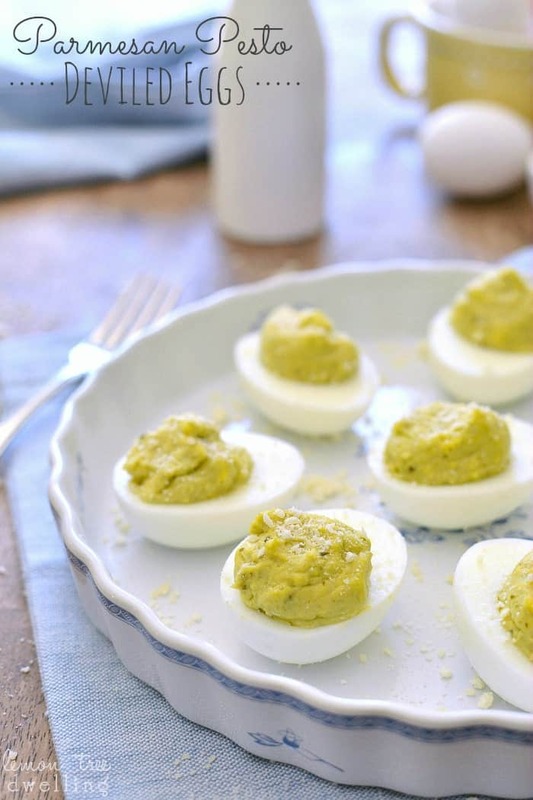 So good, in fact, that I plan to make them for Easter. 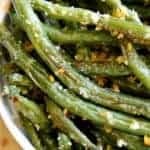 Because I can guarantee that the rest of my family would love these Parmesan Roasted Green Beans as much as I do! Of course, I may need to make a triple batch so we don’t run out….but when spring is here? And green beans are in season? There’s really nothing better. 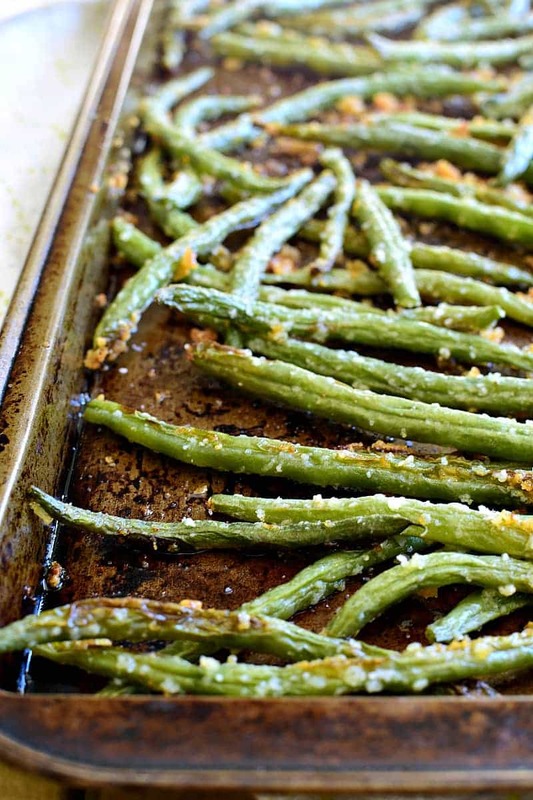 These Parmesan Roasted Green Beans are the most delicious way to enjoy fresh green beans! Perfect for holidays, dinners, or a healthy snack....and best of all, they're made with just 5 ingredients! Combine all ingredients in a large mixing bowl; toss to coat. 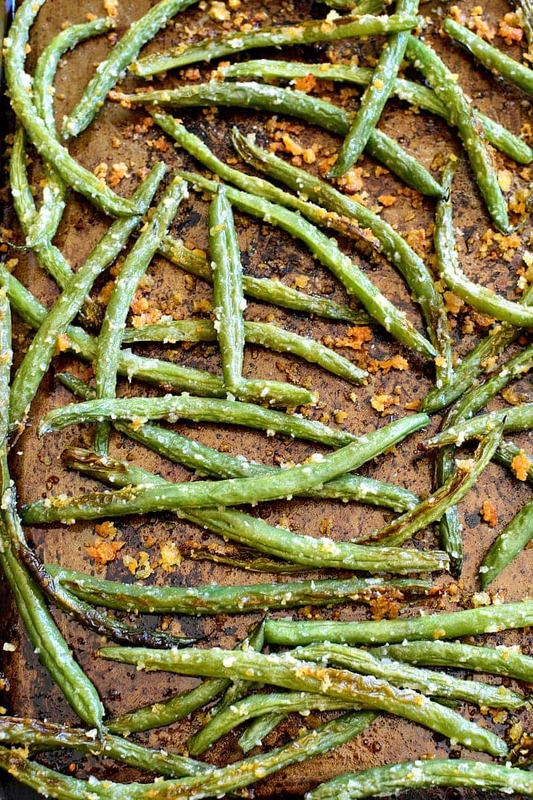 Spread green beans on a large rimmed baking sheet. Roast for 15-20 minutes; stirring halfway through. It’s getting warmer here too! I can’t wait to get rid of the mud, coats, mittens, etc and enjoy being outside in sandals again! I love the addtion of parmesan cheese to raosted green beans! YUM! Can you use frozen green beans if fresh are not available? I have found that the best use for frozen green beans is to roast them or grill them. I would start the beans in a little oil, then add the rest of the ingredients until brown. Roasting/grilling dries out the excess liquid from frozen beans. Roasting veggies with Parmesan is a sure way to get everyone to love them! These green beans are going to be a hit with my family! I LOVE roasting vegetables! I have tried asparagus with the parm, but not green beans. Can’t wait! 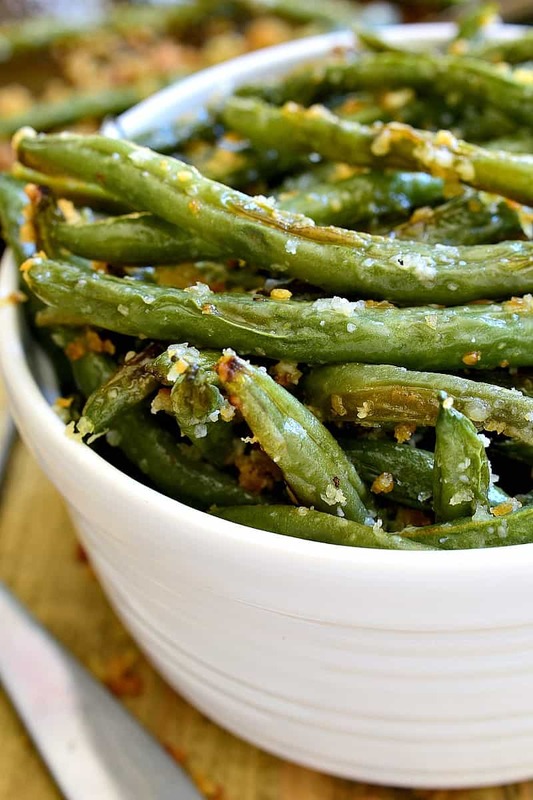 Roasted green beans are the best, and I love that you added Parm! I now have my inspiration for dinner tomorrow. Simple and tasty! Roasting vegetables are the way to go in our house too. I haven’t done green beans this way in forever though. And anything with cheese is always better! You can use a stainless steel scouring sponge to get all that grime off your pan you know. wow…. maybe they like the “aged” look. I also used crushed garlic but I added slivered almonds toasted and chopped pecans that we got this passed year from our trees. You can’t go wrong. the beans sound delicious. will definitely try this. and the garlic idea sounds great too. but that pan…it needs some serious scrubbing. I’m sorry but it looks pretty nasty. u ought to see the pans in restaurants my dear, all is ok due to the heat. that is caused from many meals prepared on that sheet and makes for a healthy meal. i , always do roasted asparagus this way with garlic added, and a small amount of lemon juice or balsamic vinegar, everybody loves them. t would line the pan with parchment paper to avoid the mess. I made these last night, and they were super yummy. I’ve made similar versions in the past, but never with the panko bread crumbs.They did add a nice crunch. In all honesty, my cookie sheets look just like yours. They still work just fine. 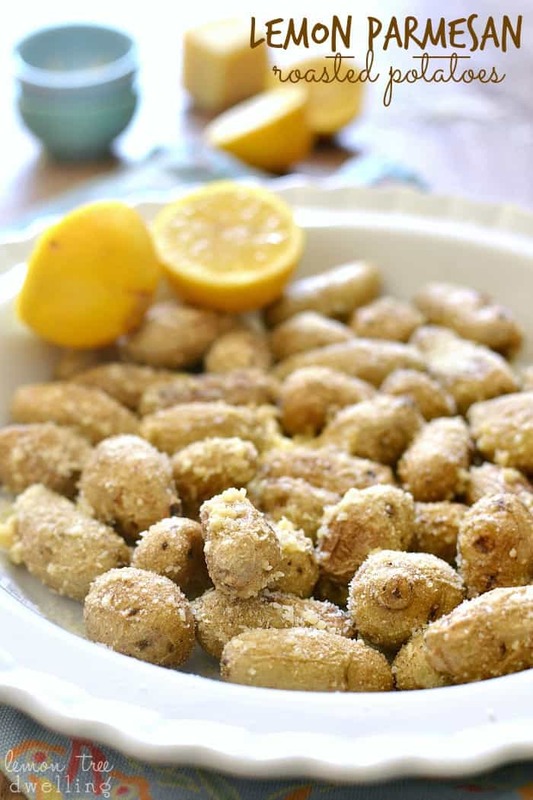 Im on a keto diet, would almond flour substitute for the bread crumbs? I am also on the Keto diet. I used pork rinds (ground up to bread crumb consistency) in place of panko crumbs. Check out uses for pork rinds on keto diet. Can you add fresh minced garlic to this recipe? I followed the instructions and my green beans were still raw and hard. The cheese and bread crumbs didnt stick to the green beans and it looked NOTHING like the licture. I even tried an extra 5 minutes and that didnt help. Then i broiled them and that didnt help either. NOT GOOD! I’ve done this recipe at least a dozen times already and everyone I’ve served it to just LOVES it!! I’ve been using a cilantro & onion infused olive oil from Emerald Coast Olive Oil based out of Destin, FL that honestly makes it such a game changer. I added a little bit of lemon zest last night when I made it too that wasn’t a bad touch either 🙂 thank you so much for sharing! Thanks for letting me know! That sounds amazing! I made these green beans tonight. They were so delicious! I added garlic per the suggestions in the comments and the whole kitchen was smelling glorious. Thank you for this recipe and spurring me on to cooking with a vegetable I don’t often cook with. Great! I’m so happy you enjoyed them! I made this once already and loved them! I’m thinking of bringing them for Christmas dinner. Do you think they could be kept warm in a chafing dish or on a warming tray? Or do you think that would ruin them? I loved this recipe. I’ve made it quite a few times. I used roasted garlic olive oil instead of regular olive oil. I also used lemon pepper flavored Panko breadcrumbs instead of regular..It was a hit!!! I never post on blogs or do reviews, but I wanted to mention how much my entire family loves this recipe. My kids and wife get so excited when they see I’m making these green beans for dinner. Thank you for making me look so good in the kitchen! Thanks so much for sharing, I made them tonight and they were amazing!! A new favorite, thanks again!!! I have made these several times now. I absolutley love them! I do add fresh garlic to them too. Can you use frozen green beans? I made the beans exactly as the recipe was written, and they were amazing! Thanks so much for the recipie, and I’ll definitely be making the beans again. FYI I did have to bake the beans for an extra 10-15 minutes. As for the pan comments, I have baking sheets that look just like yours, and I’ve got better things to do than spend precious family time scouring clean pans ! I think it shows how much we do for our loved ones, which counts the most.